This just in: we are having a GIRL!!!! Holy poop you guys, I am seriously shocked. I was CONVINCED we were having a boy, but I also knew I was going to be wrong. I told John many times "I think it's a boy, but I also think they're gonna tell me it's a girl and I'm gonna be wrong." But I was so sure baby was a boy I made them double check. Hah! Nope... she's a girl! Hilarious, because I’ve had two dreams about the baby’s gender and both times it was a girl. And both times I asked the person who told me in the dream “are you sure? !” I really thought the baby was a boy! Now, let's talk about this quirky gender reveal! My friend at work was on vacation and wanted a fun "gender reveal" after my appointment so I searched for "girl" on my memes keyboard (my favorite add-on, by the way!) and Ryan Gosling came up. So, I thought that was pretty funny and I sent it to her. 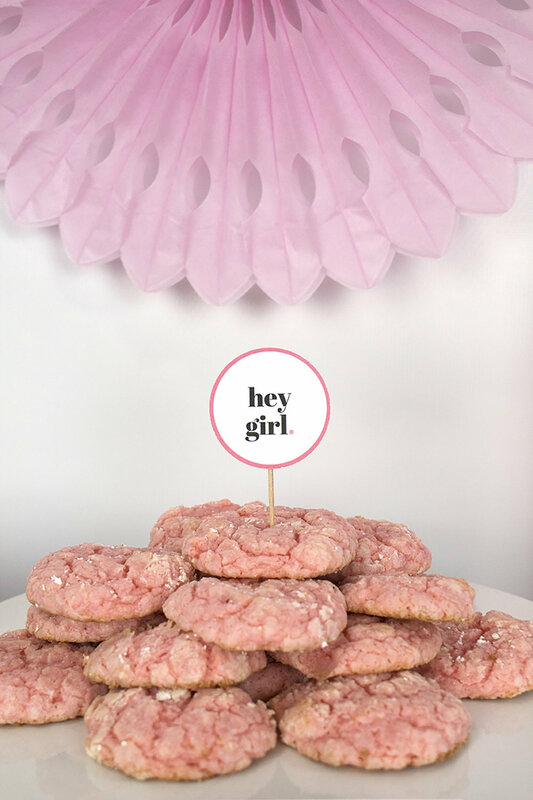 She loved it, so when it came to telling everyone at work, I made these delicious cookies (in pink, of course! ), and added a picture of Ryan Gosling next to them. And that my friends is where I got this genius idea for a party! This theme is absolutely perfect for a gender reveal where at least one person knows what the gender is (especially the mom) but I also think it would make a FANTASTIC baby shower theme!! At that point everyone knows the gender anyway, so it wouldn't ruin the element of surprise. It's definitely never been done before, so your friends won't be bored of the same old, same old! I created some unique printables for this party (inspired by these awesome invites!) that you can easily download and print to decorate, invite people, etc. The best part is that they're totally FREE! Not many things you can say are free these days, but this would actually be a super affordable baby shower. To get the free printables, just fill out the form below! Let's talk about this super easy setup! 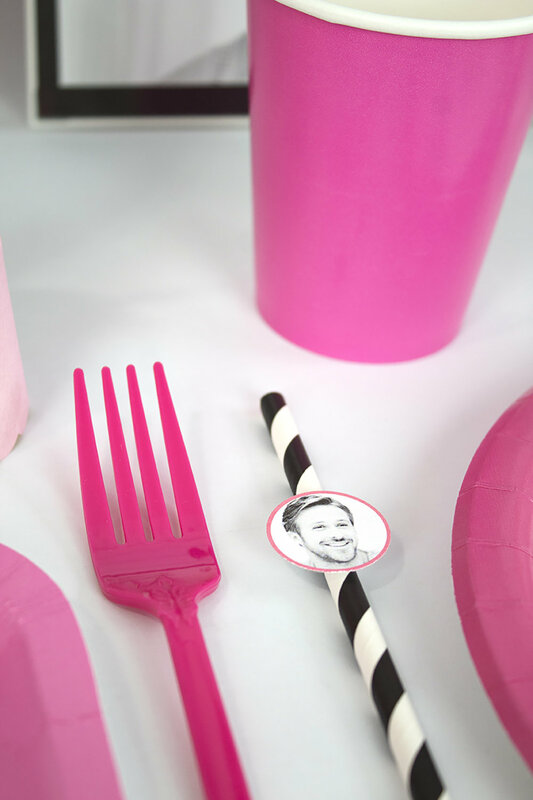 I gathered up alllll the pink items I had around my house to make this an affordable party. I used some leftover plates from New Year's Eve, as well as some super cheap frames I had on hand. These were from Walmart but you could honestly use any frames from around your house to save money, or buy super cheap ones and give them out as favors. I know I have Ryan Gosling's photo up in my office now! I mean, he's wearing a suit so it's super inspirational for success, right? I bought a pack of white card stock and used it for all the printables. I made the small circles 1" and the large ones 2" so you can use paper punches to quickly and easily cut these out! I have this and this paper punch and they worked perfectly. Then, I used a paper cutter to cut out the invites and other straight-edge things so they were nice and neat. Although it may seem like a silly expense, I've used this paper cutter countless times. I guarantee that if you own it, you'll find tons of uses for it! For the place settings, I kept it super duper simple with black and white striped napkins and a printed postcard on top. People can tape this postcard up in their house, take pics with it at the party, or just recycle it afterwards. Easy peasy! To create the cupcake picks, all you need are those paper punches I mentioned above and a toothpick. You can either tape it on, or glue it. You can make it single-sided or double-sided. You can also arrange them in a line with skewer sticks for a cake topper, or add them to drink stirrers or straws like I did. They'd also make great embellishments for a favor box or with a tiny hole punched into them as a gift tag for favor bags! Affordable cupcake stands are super easy too! I had these plastic cupcake stands left over from my ornament making party and I turned them upside down to hold these tiny cupcakes. Btw- these are store-bought cupcakes. I scraped off the frosting and piped on my own tinted store-bought frosting! It took a couple of tries and they clearly aren't perfect, but honestly they did the trick. I just recommend getting some new cupcake liners to go over the old ones, because they do kinda separate off the cupcake for some reason. These mini pink "stands" are actually just paper baking cups that I've had forever and never used. They were too big for these teeny little cupcakes, but they were great as stands! Now, let's talk about those cookies! The recipe uses cake mix, so they're super soft and fluffy. I made them for work and everyone was raving about how good and different they were. Best of all, they're super cheap and easy to make! I just used store-bought white cake mix and pink food coloring. I piled them up on top of a cake stand that, again, was left over from a blog post! For another easy decor piece, I used my lightbox sign and added a sonogram of my tiny girl. I know some people find sonograms weird and creepy (um, ok...) but I think that when it's your child it's the most amazing thing. Like... she has the cutest up-turned nose and you can even see her teeny little heart! Pure magic. To decorate the area above the table, I placed a bunch of paper fans I had laying around. I really thought I had more pink ones than I did, but most of them were a dark hot pink since they were for Halloween and Christmas posts. Had I realized, I probably would have ordered a set of pastel fans to have a nicely mis-matched set! Either way, I’m so excited to finally know more about this little baby and to buy some baby clothes. Now that I know, I can’t wait to get started on the nursery and some fun DIY projects for baby! Plus endless matching “mommy and me” outfits. 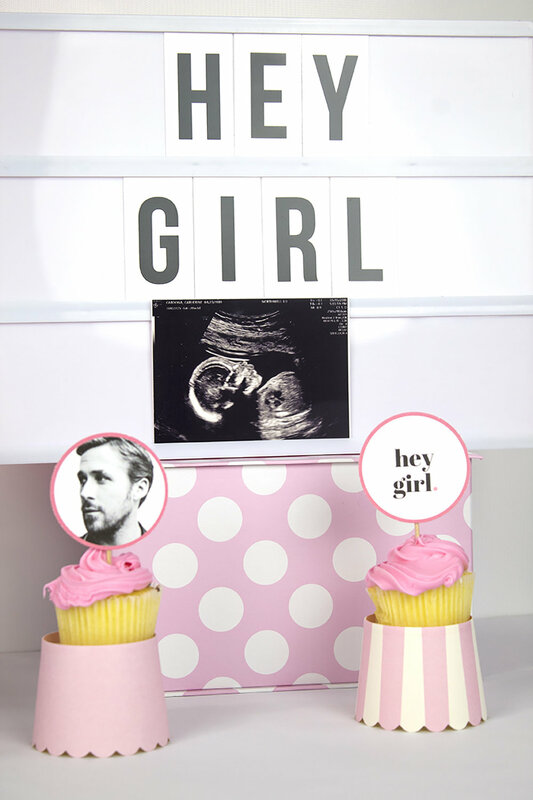 Don't forget to download your printables and create your own Ryan Gosling themed gender reveal or baby shower! It felt very "teenage stalker obsessed with a celebrity" as I was creating the party setup, but it's so much fun. So, what do you think about this idea for a gender reveal or baby shower? Now I want to do a whole bunch of amazing, uniquely-themed baby showers. What weird theme would you do? Or is this JUST what you were looking for? Let me know in the comments below! Call it a mother's intuition but I made this project before I even knew I was pregnant! I wanted them for an Instagram challenge I have since put aside, but hey... they're pretty cute and I've used them for a few blog posts already too! You probably saw them make a cameo in my Easter party post, my baby post and my Painted Notebook post. They're too awesome (and useful) to resist. Find out how to make a set for yourself! Disclaimer: I do not have children, and therefore I do not know what age this would be for. I’m going to say 3+, but please use your discretion! Mine will be mainly for decorative purposes. I don’t want any children getting hurt with toxic paint or swallowing a loose letter. Please use caution when giving this project to children!!! Pick the colors for your paint, and decide on whether you want a pattern. I wanted to do a rainbow, so I assigned each letter a color and counted out how many of each block I needed from that. Find the best side of your block to be the front, and add tape to the center as a “stripe”. I did this on two sides so that I would have the ability to add extra letters or something else to the back. Or at least, if gave me an extra option in case one side looked funky! Once you’ve taped a few (or all) of your blocks, begin painting them. Each round, I painted the “front” of the block with two stripes, 2 sides full color, and the “back” with two stripes. I did the stripes first, then the sides, and went and did a second coat on the stripes before letting it dry. Peel your tape off your blocks and save it for round 2. Make sure your blocks dry fully before doing round 2! 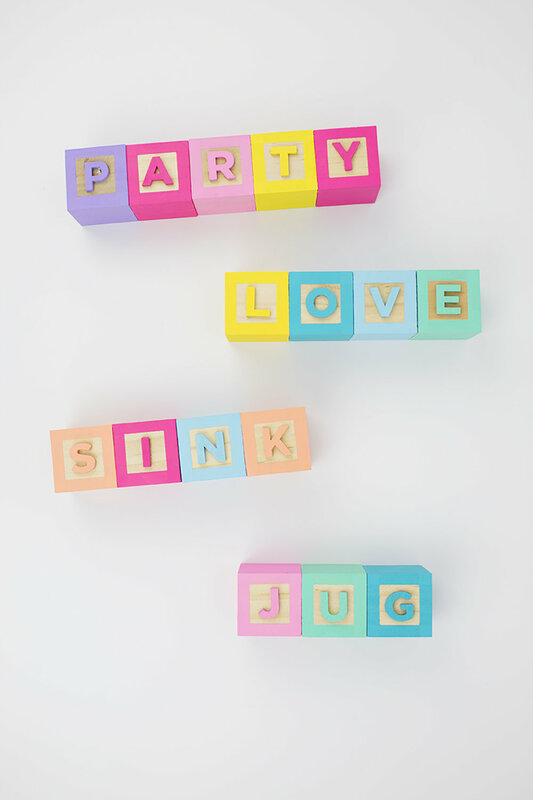 While your blocks dry, start painting your letters. I did the front and all the sides with a few coats. Take your tape, and reposition it on the sides with the stripes, this time going the other direction to form a “border” of color around the edge. Paint the stripes on the front, back, and opposite sides. And let dry fully. 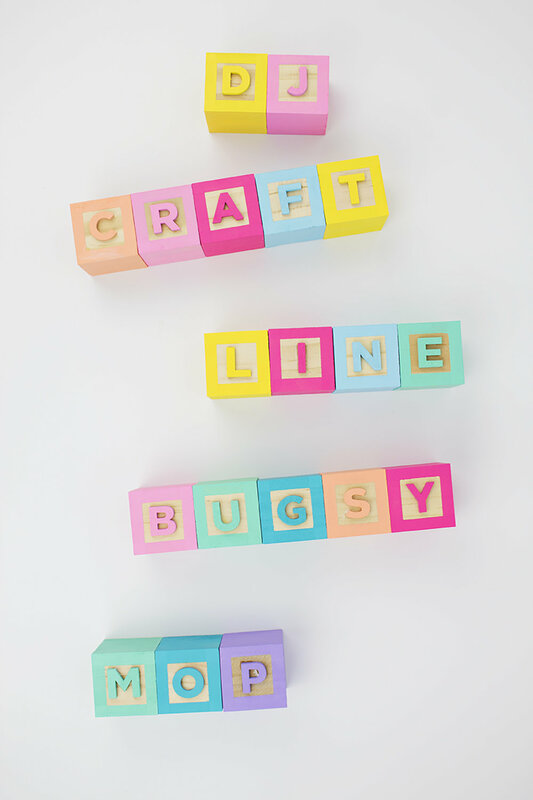 Glue your letters into your blocks and let dry according to directions. 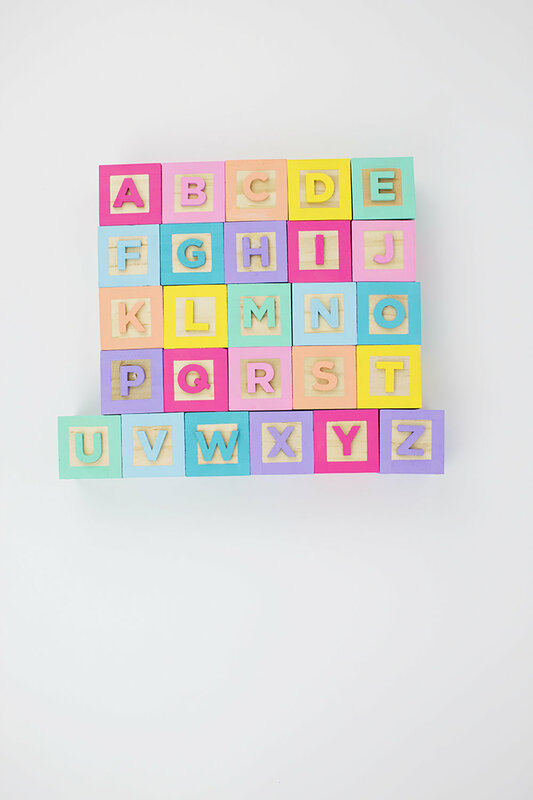 Instead of matching all the blocks and letters, try mixing them up or color blocking with different shades of the same color! I tested that below. 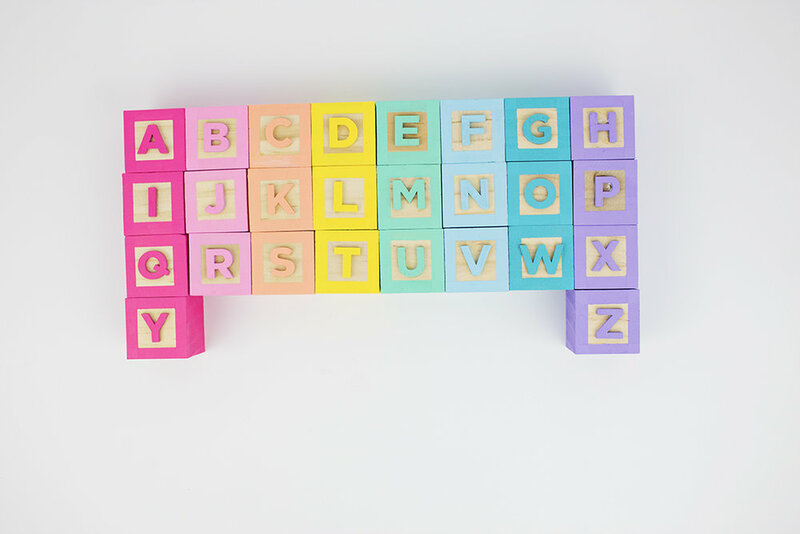 Add stamps to the sides of the blocks for extra learning fun! Ahhh! I mean, how stinking cute are these!? 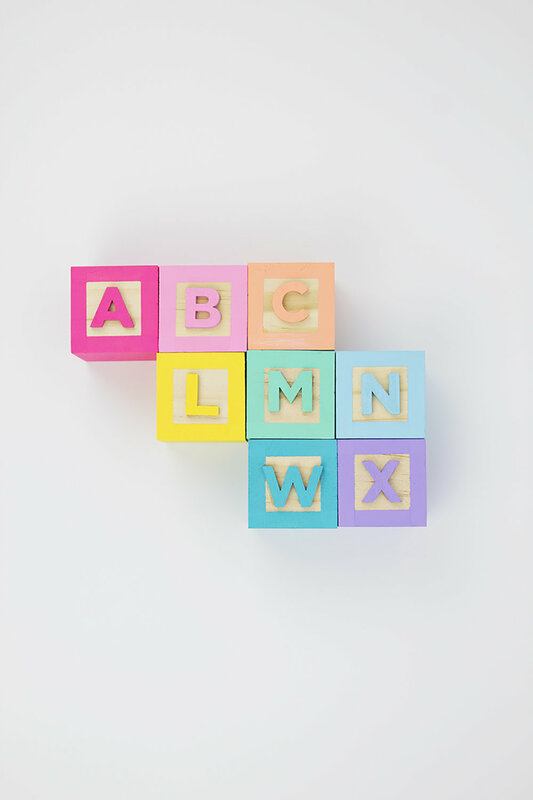 They'd also be really cute as decor with just the letters of your baby or child's name. I love love love these! Are you planning to make a set for your kids? Let me know in the comments below! 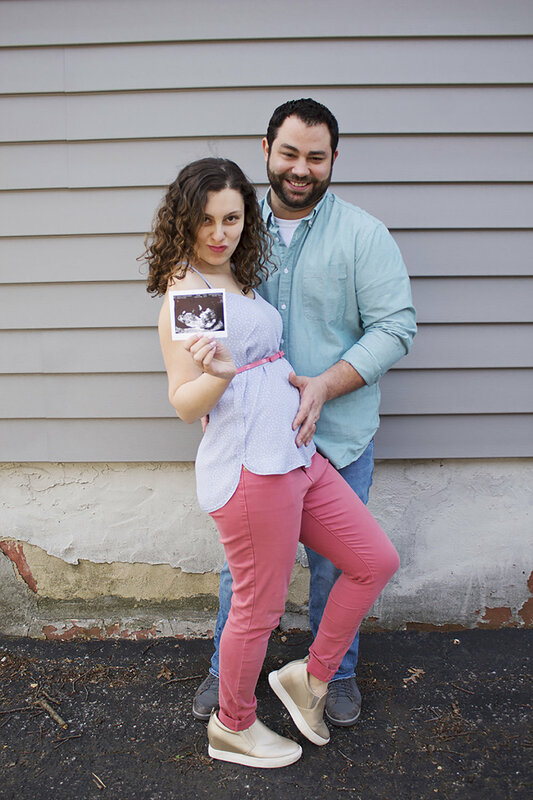 Omg you guys, we are having a baby!! John and I have been talking about having a kid forever, but we wanted to wait until after the wedding. We had only been trying since about November but for some reason, ever since I was in high school, I thought I would have trouble conceiving. I have a few minor medical issues, but for some reason I had convinced myself that getting pregnant would be really hard, if not impossible. I’ve literally cried at the thought of not being able to get pregnant. I don’t know why I felt this so strongly, but I did. 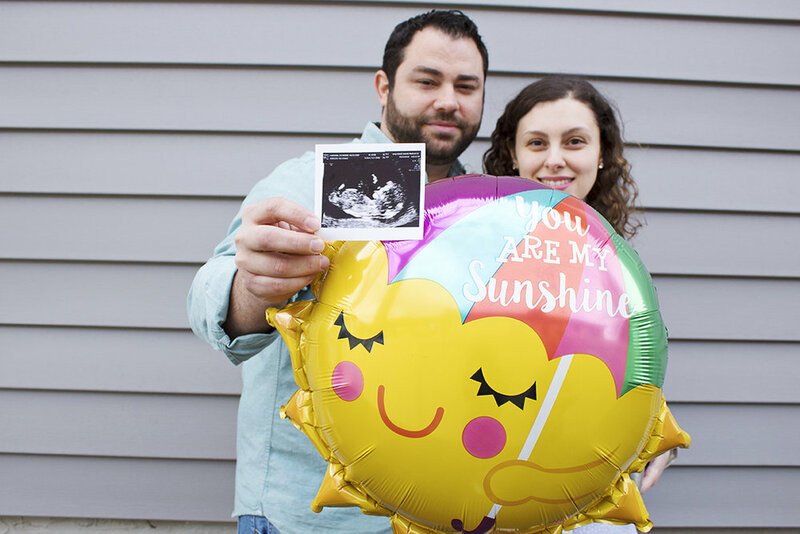 So imagine my surprise that after only a few months of trying, we got pregnant! It’s truly a blessing and something that I know I am so lucky to experience. Although I may have complained about being tired or nauseated, I know this is truly the most amazing gift anyone could ever give me and I am so happy to experience it. I was at work and wasn’t feeling 100%. Two of my coworkers that I’m friends with started looking at me funny. “I don’t knoooooow, maybe you’re pregnant!” Well, I knew I wasn’t. After all, I had bought ovulation strips and they told me I was not ovulating. So although we tried, I knew I hadn’t been ovulating when we did. They teased me about it so much that week that I figured I may as well take the test the next day. All night I had dreams about taking the pregnancy test. I was so nervous that I would forget to take it that it seeped into my subconscious and my dreams. There was never a result- just me in about 5 different dream scenarios with a pregnancy test. I woke up at my usual 5am that day, right after John had left for work. I went to the bathroom, plonked down on the toilet, and peed on the stick. I put it on the counter and watched it flow through to do its magic. One pink line. Yep, as I suspected. Then I look over again and a SECOND PINK LINE APPEARED. I was in disbelief and kept saying, out loud, “is that a second line?” I was tired (it was 5am after all!) and kept blinking and making sure I was really awake. I was. And I started to cry SO HARD. I recorded a video for John so he could see my reaction, since he wouldn’t be home for hours and I didn’t know how I’d be when I told him. The video wasn’t pretty, but it really captured my emotions. Snotty tears, shaking hand and all. I literally spent the rest of the day crying tears of joy while waiting for John to come home. I already knew how I wanted to tell John, so I did a second pregnancy test juuuust to make sure before telling him. I went to CVS and got a digital test this time, peed on the stick, and waited for 3 of the longest minutes of my life. I was so nervous that it was a false positive or something! When I finally saw the “YES+” indicating that I was pregnant, I started crying all over again. And recorded a second video for John. John came home hours later, since he had to work overtime. I tried to get him home earlier, but I didn’t want to tip him off. He didn’t even know I was taking the test! I brought him up to our room, and sat on the bed. I pulled a small Mets onesie out of my drawer and showed it to him. He looked at me confused, like “ok...?” I realized at this moment that I’m so crazy that my husband thinks I would buy a onesie without actually having a baby to wear it. Anyway, I pulled out the pregnancy test and he’s still confused so I told him I’m pregnant. Then I start crying (again) and say “we’re having a baby! !” He’s literally in shock and just home from work, not expecting this at all. So he says something like “are you pranking me?” And I’m still crying and saying no. It was like our engagement all over again! Obviously he was so happy, although cautiously so- he wanted to make sure it wasn’t a false positive. He soon realized my symptoms definitely confirmed it- I was pregnant! We had to wait 2 long weeks before we could go to the doctor to get my first sonogram. I was so nervous the whole time. 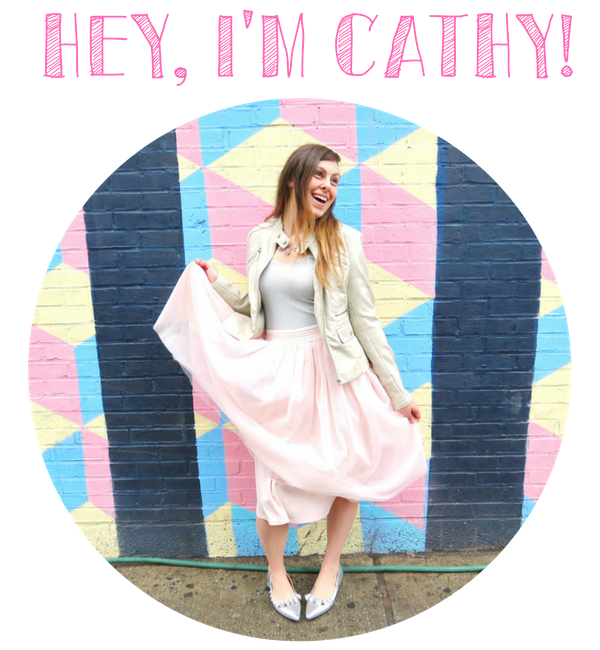 What if something was wrong, or what if I had an ectopic pregnancy? I knew 3 people that had gone through that, and it was both saddening and risky. I was hoping everything was ok. We went into the sonogram room and the tech inserted the camera and moved it around. Lo and behold, there was our baby! She showed us the heartbeat and I started to cry because everything was ok. It was such an amazing experience to see. We decided to wait until after the first doctors visit and sonogram to tell our families. We wanted to make sure everything was ok before we did. We bought everyone a frame and made copies of the sonogram. John’s mom is a huge Mets fan, so she got this Mets frame. My parents are cornballs, and amazing parents, so they got this grandparents frame. And my sister likes to keep it simple, so I gave her this plain frame. We invited them over for lunch and gave it to them as a “Valentine’s gift” so they wouldn’t suspect anything. I wanted to tell my sister separately first, so I brought her up to my bedroom. She opened the gift and got so excited she was jumping up and down! And I’m there shushing her so the parents don’t hear! We go downstairs and give the other gifts to my parents and John’s mom and tell them to open them at the same time. John’s mom suspected, so when she opened it she started to cry. My parents are oblivious so they’re opening the gift, confused, and wondering what John’s mom got that she’s crying so much. They finally figured it out too, and they were so excited! We told John’s siblings as well, and they were both really happy. I have to give my sister a special shout-out. She did the whole shoot for us! I'm very picky and the poor girl tried to make sure everything was well-framed haha. We started with the baby food shoot, which was so gross. John refused to take another bite of his beef and beef broth. He said it was like eating dog food, and swore our baby won't be eating that. Also, can we talk about how big my belly already is?! I'm wearing maternity jeans, and it was becoming impossible to hide at work. It's not so obvious from the front but as soon as I turn sideways, you can see it! I'm so happy about my growing baby bump. Ahhh! We are beyond excited about our little bundle of joy coming in September. 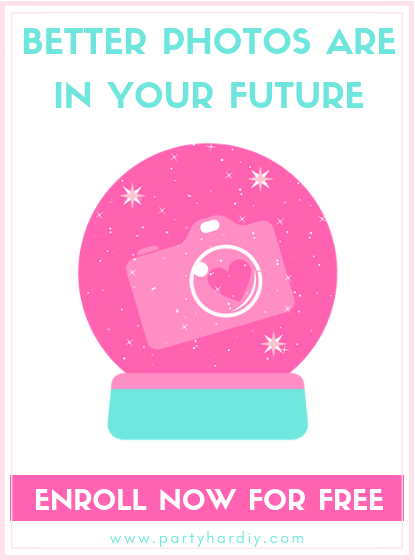 I'll be doing some fun baby-related blog posts in the next few months, including maternity clothes, nursery, and a gender reveal! We won't know until Mid-May, so we are anxiously awaiting that appointment. If you have any maternity advice, I want to know! It's been hard not being able to share the news and get advice. I'm so relieved that the cat's out of the bag now!